The mighty Brighton Rockers said they would be lining up some European opposition in 2016 and this weekend (Sat 20th & Sun 21st Feb) sees them face no fewer than THREE Continental sides. 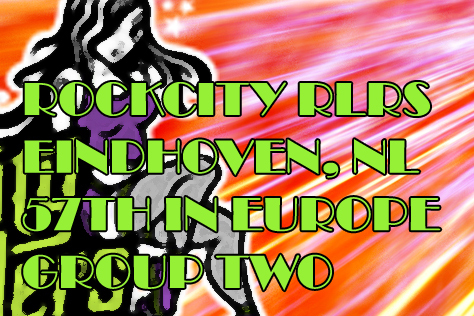 The Rockers are taking part in their first Euro derby tournament, a competition featuring six WFTDA member and apprentice leagues in the city of Caen, Normandy. This piece contains previews of all nine tournament games plus interviews with the French hosts and the Brighton captain, along with travel and accommodation tips. Firstly, here’s some general info on the tournament itself. This is the third annual Slip It! tournament and takes place at the centrally located Halle des Granges in Caen. Things get off to an early start on Saturday (10am) and yes, Brighton are taking part in that first game – so pack an alarm clock! There’s a full twelve hours of derby action (six games) on the Saturday, then a slightly less frenetic day of three games starting at noon on Sunday. For road users we suspect Dover-Calais is the best option for keeping time and costs down. Certainly it’s the option we’ve heard that most of the Brighton team will be using. Us public transport types might have considered the ferry from Portsmouth, but it seems Brittany Ferries don’t want public transport users on it. Check-in for the daytime crossing (the only one served by a bus on the other side) closes five minutes before the first train of the day can get you there! The best option then is the Newhaven-Dieppe ferry (just £30 return on foot). Although this involves a 2.5 hour £25 train journey on the other side, when you factor in the cheaper ferry price, shorter crossing time and stations right by the ports, it actually works out cheaper and slightly quicker than the Portsmouth option would have been. Hurrah! Other options include the Eurostar or catching a flight. Caen does have an airport (it’s actually much closer to the city than the port is) but the only UK location serving it is Southend. This wouldn’t normally be a problem, especially as it’s a cheap Flybe service, but there are only a couple of flights a week in winter so you won’t be able to fly back until Wednesday – gah! The best option for those who would rather use a tin can in the air than a tin can on the water? Probably Easyjet from Gatwick to Paris Charles De Gaulle (£40 each way) then a train from Gare Lazare to Caen. This doesn’t work out much more expensive than the ferry options, but the addition of the airport train and a Paris Metro hop make it no quicker and probably more hassle, especially with luggage. The Structure for the tournament is exactly what you’d expect from a six team weekend tournie. On Saturday the teams have been split into two evenly matched groups. Each group consists of three teams and will feature a total of three games, with each team playing twice (one full-length game against each of the other two teams in their group). The results of these games will give us the group standings, a league table for each of the two groups with teams placed first, second and third. These tables form the basis for Sunday’s playoff games. So the teams that finished bottom of the two groups will play each other for fifth place in the tournament overall. Then the teams that finished in the middle of the groups will play off for third place. Finally, the winners of the two groups will meet each other to decide the winner of the whole tournament. If things play out according to the European rankings at flattrackstats.com we could be in for some VERY close games on Sunday. We have the 47th/48th ranked teams plus the 57th/59th split across the groups here. Brighton are probably quite surprised at how well their Euro ranking has held up despite a tough 2015 season; indeed, one prominent player told BRATS she expected the Rockers to be the lowest ranked rather than second highest team in this tournie. So we’ll take all these predictions with a pinch of salt – particularly as Brighton have never played any of the other teams before. Flattrackstats calls this as around 66% chance of a Rockers win, with a predicted differential of 6:5. That means they expect Brighton to score six points for every five that Brussels get, which would result in a typical scoreline of say 210-175 to the Rockers. That’s pretty close so a Brussels win wouldn’t be a huge shock. As there’s no tournament/neutral option at Flattrackstats we’re having to average out home and away predictions for most of these games. However, in the case of the hosting Leopard Avengers of Caen Roller Derby, we’ll be awarding them home advantage in the calculations. Even so the website gives Brighton a hefty 80% win chance with an expected differential of 19:13. For the sake of keeping the maths simple, that suggests something like a 190-130 Rockers win. Having said that, Caen are not only the hosts but also defending champions (having won Slip It! 2) so we expect them to be tough opposition all weekend. The final Group 1 game also looks like a tricky one for the hosts if we are to believe the computer predictions. FTS gives Brussels a 68% chance of taking the win with a predicted differential of 39:32. That would mean a scoreline in the region of 195-160 to the Belgian side. These teams have met once before. That was at the very first Slip It! tournament back in January 2014, with Brussels taking the win by a super close 158-155 on that occasion, so this one could be a real nailbiter. Namur from Wallonia (French-speaking Belgium) were a late addition to this tournament following the withdrawal of Copenhagen. Though ranked five places below the Danes they are the highest placed team taking part. 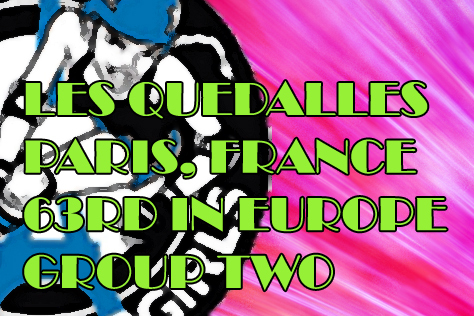 Paris Rollergirls B-team Les Quedalles were the lowest ranked of the six teams, but a good showing earlier this month against teams from Lille and Reims has seen them jump a whopping 23 places in the rankings. Nonetheless, Flattrackstats give the Belgians 72% chance of the win here with a predicted differential of 47:34. If true that would mean something like a 188-136 Namur win. This shows you the effect Les Quedalles’ good results a week or two back have had on the (rankings based) prediction computer. When we ran the predictor before those games it gave Rockcity 82% chance of taking the win here. Once those three games on 6th/7th Feb are factored into the Paris ranking, Rockcity’s chances have dropped down to 62%. The suggested differential of 7:6 would equate to something like a 154-132 victory for the Dutch side from Eindhoven. That’s super close in derby terms, so this one could go either way. Should the computer predictions for the first two Group 2 games have proven correct (which is unlikely – we’re expecting at least one upset in each group) then this match will decide the group winners. Flattrackstats favours the Belgian side here, giving Namur 65% chance of the win. The differential is pretty close though at 27:22, which suggests a scoreline in the region of 162-132. Rockcity have won their two previous games against Namur however (in 2013 and 2014) so take nothing for granted! We aren’t going to include any predictions for Sunday’s playoff games as we really wouldn’t like to predict which teams are going to finish where in the group tables. Certainly several teams here are ranked quite a bit higher or lower than their most recent results would suggest. This is particularly apparent when looking at possible playoff match-ups. For example, hosts the Leopard Avengers beat Paris B by almost 300 points at Slip It! 2 and Caen’s only ever game against the highest ranked side here Namur (less than a year ago) saw the French side triumph 192-93. Rockcity are the only Group 2 side the hosts haven’t played before. An all-Belgium playoff game would prove an interesting proposition. Brussels and Namur have met three times before and the most recent meeting saw the Derby Pixies triumph by a single point: 170-169. Les Quedalles are also no stranger to Brussels with one win apiece in the teams’ previous meetings. Could there be a ‘best of three’ decider in Caen? As for a Brussels v Rockcity game, that would be the SEVENTH public meeting of the Benelux sides. The teams have been taking it in turns to win with scorelines to date [Brussels scores listed first] of 192-172, 165-202, 122-100, 152-182, 142-79 and 167-176. No-one would be brave enough to predict the outcome of a ‘best of seven’ decider here! Whoever Brighton meet on the Sunday will be a new opponent, although the Rockers have previously played (and narrowly beaten) the Paris Rollergirls A-team. Whatever the make-up of the tournament’s three playoff games, we’re expecting them to all be pretty close. Even the FTS predictor throws up 52%-48% win chances for a couple of Sunday’s potential match-ups! This match features the teams who finished bottom of the two groups. The ‘bronze medal match’ is between the two second place teams. The final sees the winners of Groups 1 & 2 battle for the tournament title. 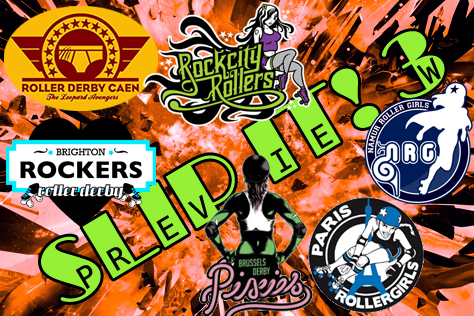 Can you tell us a little about the history of Roller Derby Caen and the Slip It! tournament? Do the Leopard Avengers have any special players or tactics that fans should look out for? 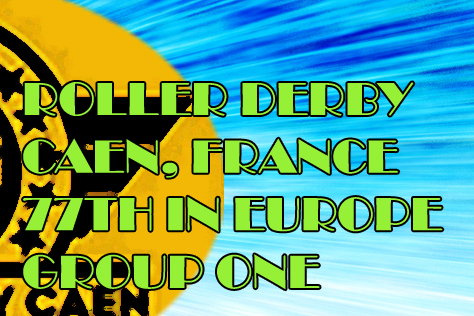 Roller Derby Caen was created in 2011 by our President and Captain, Chantal d’Acier. In the beginning we were just a few skaters and thus unable to play under our own colours, so we had our first games with Team Normandy. We played our first tournament as the Leopard Avengers in 2013. Since then we’ve played regularly and despite being a small league, we managed to become strong enough to be in the Elite category (the highest) in the first French Championships. We were accepted in late July as an Apprentice Member of WFTDA. As you can imagine we were really looking forward to making it! Since this year we’re happy to also have a B team, Les Pétrolleuses, which will allow our Fresh Meat to start playing games more quickly. We’ve been organising the Slip It! tournament for three years now. It’s well known in France and now throughout Europe. This year’s Slip It! will be 100% WFTDA teams, and we will be hosting players and referees from many different European countries. As for our special players and tactics, we prefer to let you see for yourselves and have the full surprise! Have you played many of the teams at this year’s Slip It! before? Are any teams totally unknown to you? How are you hoping to do in the tournament and which teams do you think will do the best? Can you tell us a little about your venue? Is there much seating for fans? Vendors? Food? Most importantly, is there are a bar? La Halle des Granges is a big place with a very high ceiling. It is really cold during the winter, so tell people to bring warm clothes (scarves, gloves, fleeces) to feel more comfortable, and blankets too. You will find bleachers and a big suicide zone to sit in, vendors (roller derby stuff, team merch, etc). There is a bar where you can have some homemade soups, cakes, sandwiches in fresh baguettes, plus hot and cold drinks. We do apologise but we don’t have the right to sell beer or wine. It is strictly forbidden by the City Of Caen to sell alcohol at an athletic meeting. We are sure you will find a way to have some! For fans travelling to Caen for the tournament, is there anything you suggest to see and do (as a tourist) in the area? 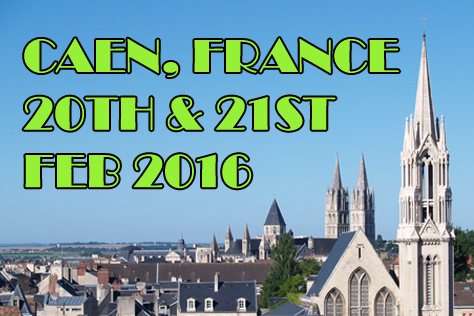 The city centre of Caen is lovely and there are also many places you can visit in the surrounding area. First you should have a look at L’Abbaye aux Hommes near to the venue. It was erected by William the Conqueror himself, in a pure Norman style, and he’s buried there. You can also visit L’Abbaye aux Dames, which was founded at the same period. Still in the city centre you have the Ducal Castle at the top of which are the Fine Arts Museum and the Museum of Normandy. Close to this is St Pierre’s church. Also check out the Caen Memorial, a museum and war memorial commemorating the Second World War and the battle for Caen, during which the city was almost completely destroyed. Around Caen if you drive about 40km you can visit the D-Day beaches and the artificial harbour (Mulberry Harbour) of Arromanches. 20km from Caen you’ll find the famous Bayeux Tapestry. Embroidered by Queen Mathilde and others, this illustrates the events of the Norman Conquest of England, particularly the Battle of Hastings. Are you selecting a full squad of twenty players for Caen? Any new players or tactics we should look out for? How have preparations been going? We understand part of the roof recently blew off your Hove training venue! We’re taking nineteen skaters altogether – this includes two subs. The core seventeen includes four of our wonderful B-team who have been working their butts off and are now making their A-team debuts. We have decided to play a little short, partly to keep track time up and also to ensure we have solid line and pack rotation. We’ve been working on new tactics (you’ll have to wait and see what they are) as well as strengthening our defaults. A lot of our training time has been focused on that. When we lost the training hall for a night due to the storms, we ended up having a three-hour tactics meeting instead. This included some of our players patching in on Skype! According to the current European rankings you’re the top rated team in Group 1 here. Do you consider yourselves favourites? 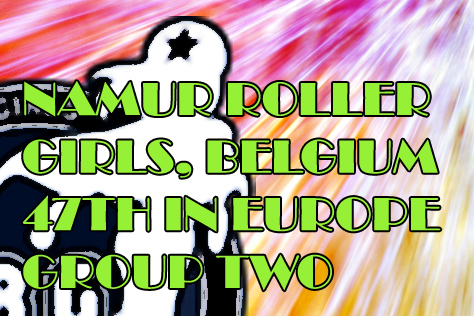 What do you know of your opponents (Brussels and Caen in the group; then one of Group 2’s Namur, Rockcity or Paris B in playoffs)? I think these will all be hard games, to be honest. We tend not to focus too much on rankings, since the moment you think you’ll have an easy ride the other team will always surprise you! We’re doing our research on everyone in preparation, but we will be playing our own game and will be ready to react to whatever team is on track against us on the day. The Rockers said a big reason for quitting British Champs was to take on more European opposition in 2016. Are there more tournaments in the pipeline? Or will it mostly be one-offs for the rest of the year? You’ll still face UK teams too, right? Yeah, we’ll be playing UK teams too. One thing we really missed during our Champs season was the freedom to choose who to play. We’ve got a few UK games confirmed including LRG Batter C-Power (in Tottenham on March 12th) and Newcastle B, as well as some other exciting European games in the pipeline. Currently there are no more tournaments confirmed, but we’ve not finalised our season just yet so watch this space!